Consumers appreciate speed and convenience. Today, a whopping 79% of Millennials order food online through one of various restaurant online ordering systems. In our interconnected world, restaurants must leverage online ordering to stay competitive. But, how do you set up an online ordering system? Should you work with 3rd party delivery partners? And what does all of this cost? Today, we’re going to give you an insider’s look at restaurant online ordering systems. We discuss the pros and cons of setting up your own in-house ordering system, and we also give you the goods on food delivery apps saturating Facebook and YouTube ad space. How do each of the 3rd party platforms operate? How much do the various restaurant online ordering systems cost? What geographical areas do these 3rd party platforms cover? What are the pros & cons associated with working with each online ordering system? How do SaaS online ordering systems for restaurants work? How to choose the perfect combination of restaurant online ordering systems to work with and why? Does my portfolio of 3rd party online ordering partners provide my CUSTOMERS both convenience and value? Am I doing my restaurant brand justice? Are there any areas where I can consolidate platforms? Is my brand working harder for less money and if YES, is there a foreseeable light at the end of the marketing tunnel? Delivery Apps Are Hot, But How Do They Affect Your Bottom Line? If the idea of making dinner reservations seems antiquated, you’re not alone. The online food delivery market is slated to grow from a $35 billion global industry to a $365 billion behemoth by 2030. Fancy Silicon Valley startups and venture capitalists love this growing market. Diners can simply download an app, make an order, and wait for delivery of their favorite meal. What’s not to like? In 2016, 44% of U.S. customers used a food delivery service, and 3% of U.S. customers used a food delivery service DAILY. That’s a sizable client base. Today, these numbers are much higher (some studies suggest up to 86%). In fact, online ordering is the fastest growing food consumption vertical. The NRA predicts that 70% of customers will eat off-premise by 2020. In a nutshell, online ordering has grown 300% faster than dine-in traffic over the past 3 years! Additionally, online ordering is set to overtake phone ordering, with customers spending 20% more on online orders. So, delivery apps are all the rage, but are they good for restaurants? After merging with Seamless and axing Eat24, Grubhub is now the leader (34.4% market share) of the pack. Originally, Grubhub was best known for digitized menus via its acquisition of AllMenus. But, after integrating Eat24 into its business and merging with Seamless, Grubhub is the undisputed king of the food delivery giants. In total, Grubhub operates 6 brands: Seamless, AllMenus, LevelUp, Eat24, Tapingo, and MenuPages. As of Q3 2018, Grubhub is partnered with 95,000 restaurants and has 16.4 million active diners. This gives Grubhub the largest portfolio of restaurant partners and customers than any other food delivery platform. Marketing Commission Fee: Grubhub’s commission fee is dependent upon the restaurant contract, and each restaurant may have a different fee. These fees range between 13 – 30% of the total order cost. Processing fee: Grubhub charges a processing fee of 3.05% + $0.30 per order. Delivery fee: If you use Grubhub to deliver your meals, you’ll be charged a 10% delivery commission fee. According to Grubhub, new restaurants are on-boarded at a minimum fee of 17%. However, many also choose to join Grubhub at the Sponsored Level (20% +). It’s important to note that the Marketing Commission Fee directly relates to how well Grubhub promotes your restaurants. Essentially, it’s a pay-to-play game. The higher the “commission package” that you choose, the higher your restaurant is going to appear in Grubhub’s search rankings. So, total commission fees can range from 23.05% + $0.30 for a restaurant using its own delivery drivers sans promotional services. On the other hand, a delivered meal that includes marketing exposure on Grubhub could cost a restaurant a whopping 43.05% + $0.30. Grubhub has drivers almost anywhere in the United States. Since the platform has been around for such a long time, it covers a broad and ever-expanding list of markets. If your restaurant is in a decent-sized city, Grubhub probably services that area. Here’s a full list. In total, Grubhub delivers to over 17,000 cities worldwide, with the bulk of deliveries in the United States. When restaurants first sign up with Grubhub, they select a Marketing Commission level, which determines how well Grubhub will promote their product. Then, the restaurants supply Grubhub with their menus and list prices. Next, restaurants are added to Grubhub’s list of available restaurants and given exposure on Grubhub’s website. From here, anyone can order food from your restaurant through Grubhub’s app and website. *Remember: If you don’t have any delivery drivers, Grubhub will happily deliver your food products to customers — for a 10% commission fee. Signing up is a relatively pain-free process. It’s important to remember that working with any food delivery service introduces new logistical challenges. You have to figure out a way to get products to customers: hot, delicious, and well-presented. Also, there’s a waiting period until your restaurant receives payment. This means that you’ll need a flawless cash management process in place to account for it. Amazon’s foray into the online delivery business is hardly surprising. Unquestionably, its $13.7 billion acquisition of Whole Foods now makes it the world’s third largest retailer. So, what’s Amazon’s main goal? To dominate the lucrative online delivery market, of course. To date, Amazon For Restaurants only caters to Amazon Prime customers. And, what a customer base: Amazon Prime members spend more than twice non-members every year. Not surprisingly, Amazon has staked its success on this valuable client base. There’s presently no upfront cost or time commitment for joining Amazon For Restaurants. Currently, there’s a rev-share in place. However, commission rates haven’t been made public, although they are said to approximate 30% of every order. The platform operates in more than 25 major cities in the US, including New York City, Chicago, Atlanta, Las Vegas, Los Angeles, Miami, and Houston. Sign up is easy: fill in an online form, and an Amazon For Restaurants professional will contact you. Next, Amazon creates a restaurant page for you, complete with menu sections and professional shots of your restaurant’s dishes. Customers order from you through the Amazon Restaurants portal. You get instant alerts whenever orders are placed. Amazon takes care of deliveries, of course. Uber Eats is a restaurant delivery app that’s part of the Uber family of services. Currently, the platform is Grubhub’s biggest direct competitor and the strongest performing (growth-wise) Uber product on the market. The Uber Eats service utilizes Uber’s existing network to deliver food products to diners around the world. Uber Eats is growing at a rapid pace; with its current growth pattern and aggressive marketing and acquisition campaigns, some analysts predict that Uber Eats may even overtake Grubhub in market reach. Currently, the delivery market is fractured, but it’s also pretty well standardized. Commission fees tend to be high across-the-board and market practices are similar. Any major acquisitions between the top players would not be earth-shattering developments. Uber Eats has a more transparent commission system than Grubhub — though the commission rates vary. For a typical restaurant, Uber Eats charges a 30% commission fee on list price. This means that 30% of the price of food is going directly to Uber Eats. Fortunately, this commission fee automatically includes delivery as well as processing. It’s important to note that Uber Eats also allows restaurants to pay-to-win by giving them higher revenue-sharing. Note: Uber Eats prohibits restaurants from increasing menu prices within Uber Eats. Uber Eats doesn’t operate in as many cities as Grubhub. In total, the platform is only operational in about 300 cities, though that number is growing rapidly. Similar to Grubhub, Uber Eats first requires restaurants to fill out a form, share menu information, and opt-in for marketing-based revenue-sharing. Next, restaurants will use the Uber Eats POS to track orders and drivers. Finally, drivers will pick up the orders and restaurants are paid at the end of the pay period. *Remember: Uber Eats includes delivery services in their flat commission rate, which means that the ROI of using in-house delivery drivers will be low for restaurants that work with Uber Eats. Flat rate commission fee includes delivery services. Fast growth and plenty of users. Probably the most aggressive marketers out of all the most popular delivery apps. 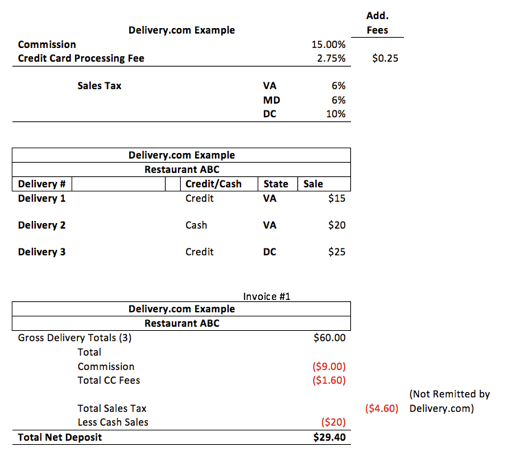 With 30% commission fees, restaurants will lose money on almost every order. Uber Eats’ aggressive marketing may prevent customers from switching over to in-house ordering systems. DoorDash is another courier service that delivers food to diners across the globe. There’s big money backing DoorDash: in its last round of funding, DoorDash sat pretty at a $1.4 billion valuation. The differences between DoorDash, Uber Eats, and Grubhub are minimal, however. All of them charge commissions, offer food delivery, and leverage marketing/ distribution campaigns to draw in restaurateurs. However, if we dive a little deeper, each of them offers unique value propositions. DoorDash contracts all of their drivers, which means that restaurants can actually dig into driver analytics. Also, you can track DoorDash drivers and see expected delivery times. DoorDash has varying fees based on location, size, and other factors. All things considered, you can expect revenue-sharing to be somewhere between 20 – 25% per order. This includes delivery. Like Uber Eats and Grubhub, you can’t charge extra in the app to make up for the difference. So, every customer who uses DoorDash will end up costing you 20 – 25% extra, which may mean little-to-no net profit for your restaurant. The platform operates in far fewer cities than both Grubhub and Uber Eats. As of this article (Jan 2018), DoorDash operates in 67 cities total. Similar to Uber Eats and Grubhub, DoorDash requires restaurants to sign forms, complete signup, and, finally, get listed on its website/app. Once your restaurant is on DoorDash, the following steps will take place once a customer decides to order a meal. The customer searches for a restaurant, chooses one, and places an order after viewing that restaurant’s menu. He pays for the product, and the restaurant is alerted that a customer has placed an order. The restaurant prepares the order and uses DoorDash’s proprietary software to track drivers. Meanwhile, the driver picks up the order and delivers the order to the customer. At its core, however, Postmates is another delivery logistics app. The Postmates commission fee is shrouded in mystery. Since the company operates on a contract-by-contract basis, there’s no way to dig deep into commission analytics (the company doesn’t post any). According to most sources, 20 – 25% per order seems to be the norm. Some Reddit posts claim that the number is closer to 28%, but restaurants will be forced to negotiate their own commission fees. The platform operates in +250 cities in the US and Mexico. Contact (or get contacted by) Postmates and negotiate a contract commission. Restaurants are sent a tablet by Postmates that acts as an order tracking and payment system. The restaurant menu is uploaded to Postmates and orders placed via Postmates will come through on the tablet. A driver will pick up the order and deliver it to the customer. Local restaurants drive the Caviar platform. Essentially, Caviar wants to go beyond delivery as a business. The company has a partnership with Square (a POS system), and it operates in a few select cities. Caviar caters to both small restaurants and Michelin star restaurants in an attempt to focus on a more robust restaurant clientele. Information about Caviar’s pricing structure is a little sparse. Like many of the others on this list, Caviar works with restaurants on an individual basis. Commission fees lie somewhere between 25 – 30% per order. However, that price includes some nice benefits. Caviar will send someone out to professionally shoot photos of each of your menu items. The platform currently services only 26 areas, giving it the smallest area of operation on this list. Restaurants register, sign the contract, and submit their menus. Next, Caviar will encourage them to use Square Point-of-Sale. Afterwards, Caviar will send someone out to take menu photos (if the restaurant needs it). Restaurants use the Caviar app to track orders and delivery driver information. When it comes to delivering, Delivery.com does it all. Restaurants, liquor stores, grocery stores, dry cleaning, and home goods are just some of the verticals that Delivery.com operates. Recently, Delivery.com also offers an open API for delivery services, which LevelUp, Foodme.io, WeWork, and other delivery-based apps utilize. Delivery.com charges 15% + 2.75% + $0.25 per card per order. On top of this, the company offers premium services, such as websites, professional photography, and more. Again, Delivery.com utilizes the pay-to-win model by leveraging paid services to get ranking and marketing boosts within their system. Delivery.com operates in +36 cities. Restaurants sign up for Delivery.com as a merchant. Then, restaurants can choose to immediately start working with Delivery.com or use their premium services. Generally, restaurants will use the platform POS on any device to track and fulfill orders. Like Caviar, Slice (also known as Slicelife) has a unique value proposition: it only offers pizza. Also, Slice doesn’t actually offer delivery services. Instead, the company connects restaurants to pizza lovers across the world via an app (and website). Slice also has a unique commission system. Instead of revenue-sharing based on a percentage of the sale, Slice charges restaurants $1.95 an order — regardless of the order size. Slice currently operates in 40 states. To see a full list of cities, check here. Pizzerias first sign up with Slice and upload their menus onto the Slice platform. Slice will add them to the app. Users make orders, but you’ll have to deliver those pizzas — not Slice. Slice takes a $1.95 cut from each order. Slice is more of an app and marketing system than a delivery service. But, the app is competing in the same niche as the rest, so Slice is worth a mention — especially for pizzerias (which typically hire their own delivery drivers). If you’re ever wondered why kryptonite hurts Superman, you’re not alone. The Internet is full of forums asking the same question. However, the answer is surprisingly simple. Kryptonite is a radioactive element that displaces the solar radiation powering our hero’s superhuman strength. Back to delivery apps. Today, third-party delivery apps are big business. They’re easy to use, convenient, and fast. In short, they’re everything a modern consumer wants. All things considered, the restaurant industry may well see to-go sales pushing past the 10% mark by 2020. But, there’s a catch. Restaurants stand to lose revenue on every single order because of the standard 25-30% commission fees. Here’s a startling statistic: only 12% of restaurants think that the commission fees they’re charged are fair. Meanwhile, a whopping 82% think the fees are too high. Additionally, since the average restaurant survives on a 2–7% profit margin, working with these apps seems like marketing sepukku. What you need is marketing kryptonite: an in-house online delivery system tailored to your brand and capable of displacing the commission fees eating up your profits. If you need more convincing, industry research shows that digital orders generally account for 52% of deliveries. So, setting up your own online ordering system is definitely a smart marketing move. Here’s what no one tells you: You don’t need to be a marketing guru to expand your brand reach and market share. You just need to leverage the right tools to your advantage. The cost of creating an in-house portal that has the UX and robust features customers are already accustomed to is unsurprisingly cost prohibitive for restaurants. Developer salaries as well as cloud management costs would negate any profit margins quickly. Additionally, a dedicated tech staff would be needed for constant updates and feature requests, further burdening already strained budgets. However, there’s a viable solution, even if a built-from-scratch system isn’t feasible. Software-as-a-service (SaaS) ordering systems are fully functional ordering platforms that you can instantly integrate into your current business architecture. But, which one should you use? This part is tricky because not all SaaS restaurant online ordering systems are created equal. While delivery apps certainly have their place in the digital delivery business, 9 Fold’s Software-as-a-Service platform helps restaurants stay competitive, agile, and adaptive to evolving consumer demands. A branded in-house online ordering system for restaurants reduces order mix-ups and allows customization of prices, menus, and marketing campaigns. Restaurants reap increased revenues as a result. What sets 9Fold apart? First, it’s a unique in-house ordering system that’s fast, responsive, and undeniably brand-conscious. Restaurants using the 9Fold online ordering system report an average 25% customer conversion rate from their 3rd party partners. Your in-house delivery platform lets you control how you manage logistical challenges such as delivery times, which in turn highly impacts the customer experience. 9Fold costs $129/mo per location (+$100 for a first-time setup) + CC processing. There are no hidden marketing fees or commissions. Industry researchers highlight a particularly revealing statistic, however: 38% of restaurants say it’s difficult to break their dependence on third-party platforms. For illustrative purposes, let’s say that 500 people ordered food from your restaurant during a one month period. Overall, each person ordered $35 worth of food. With Grubhub, you’d be paying (conservatively) about $3,500 for the month based on the current commission structure, not including processing fees. Using the 9Fold platform on the other hand would ring in at $129 for the month. Contrary to belief among some restaurateurs, it’s important to note that many restaurants receive more orders through the use of a SaaS restaurant online ordering system. In fact, studies show that 81% of diners generally prefer to use a restaurant’s own website as opposed to a delivery platform like Uber Eats. Here’s everything that the 9Fold online ordering system offers to restaurants. Responsive menus: Your website’s menus will automatically adapt to any screen size. Dedicated dashboard management: You can retrieve your orders, update your menus, and edit delivery routes in minutes. Additionally, for no additional cost, a dedicated response team will help you respond swiftly to shifts in customer demand. Couponing: 96% of consumers use coupons! So, leveraging coupons is a great way to score loyalty points and draw in first-time diners. 9Fold provides restaurants a robust and easy-to-use couponing system. 24/7 monitoring: This is more of a service than a software tool – 9 Fold’s human specialists dedicate time to tracking orders and restaurant menus. Ease-of-Use: Why are Grubhub, Uber Eats, and Postmates restaurant online ordering system so popular? They’re unquestionably easy to use! However, 9 Fold’s online ordering system offers the same ease of navigation. The entire system is image-centric, fast (with one-click re-ordering), and responsive. Branded ordering: 9 Fold builds your SaaS online ordering platform around your brand. So, what you get is an in-house ordering system that specifically aligns with your business objectives and feels like an extension of your storefront. Order Management: Connect your online ordering platform to a desktop or Android tablet via the 9Fold order manager app and route it directly to a thermal printer. Optionally, you can connect to more than 20 of the most popular POS systems through 9 Fold’s partners Chowly and ItsaCheckmate. Email marketing: Another key point: 9 Fold’s “out of the box” system allows you to leverage certain email marketing tools for free. The platform creates branded email campaigns for you based on consumer data, with no heavy lifting required on your end. Social tools: Engage your customers with 9 Fold’s built-in ratings system and social tools. Smart feed-back tool: Regardless of your restaurant’s value proposition, complaints are often unavoidable. With 9 Fold’s amazing tool, you get to correct negative feedback before it makes its way to social media. As has been noted, 9Fold isn’t the only SaaS restaurant online ordering system on the market. Below, we discuss today’s most popular SaaS portals. ChowNow is an established SaaS online ordering system. Currently, ChowNow is one of the biggest (in terms of volume) SaaS players on the market, boasting thousands of restaurants across the US. $150/ month on a monthly plan, with a $399 set-up fee per location. $119/ month on a yearly plan, with a $199 set-up fee per location. $99/ month on a two-year plan, with a $199 set-up fee per location. Another big player in the digital platform space, OLO has specifically built its online portal to cater to larger chain restaurants. OLO is also a delivery-enabled platform. Its Dispatch service connects you to nationwide delivery couriers, such as Postmates and DoorDash. All things considered, you’ll still be responsible for additional fees for Postmates or DoorDash delivery services. Currently, OLO only works with 250 restaurant brands, which may seem inconsequential; however, many brands have 100+ locations. In terms of pricing structure, OLO does not reveal its pricing online, as it likely varies by way of volume discounts and negotiated contracts. Deep integration with POS systems, loyalty programs, and payment providers. This online platform is based in India and was founded in 2012. $45/ month basic account, which includes mobile web ordering, real-time order notifications, coupon builders, order management dashboard, and rewards programs. $85/ month premium account, which includes all Basic features as well as driver management, and printer/ fax order notifications. Pricing for enterprise accounts depends on customizable options. The Enterprise level, however, does come with POS integration. All in all, MenuDrive is an inexpensive option. Founded in 2009, the platform offers excellent, branded in-house delivery system options. But, unlike the rest of the SaaS providers on this list, MenuDrive presently offers no social integration tools. $90/ month on the yearly plan, with a $99 menu set-up fee. The yearly plan is less expensive. However, the fees must be paid up-front. Inclusive store management platform, offering menu builders, custom delivery zones, and multiple order types (dine-in, delivery, curb-side, and pick-up). Analytics-based platform, which provides insight on customer data. Automated alerts to prevent missed orders. Delivery options are critical for restaurants that want to remain competitive in an increasingly digital market. In fact, many restaurants are reinventing how they handle delivery or take-out orders. Some have staked out specific areas just for digital pick-up orders, while others have launched digital-only eateries. By working with Software-as-a-Service brands, restaurants can leverage branded online delivery systems to provide their customers an unparalleled user experience. Many restaurants utilize both delivery apps and SaaS simultaneously. They tap into the wide customer base on third-party platforms and then leverage their own in-house delivery systems to convert these new customers. Consider organizing your online ordering ecosystem as if it’s a financial portfolio. Ensure stability by making it fairly diverse and goal-oriented in nature. 1. It’s tempting to focus on platforms that offer the cheapest commissions. However, you’d be better served choosing platforms that offer optimal functionality and access to a broad customer base. Start by choosing all available platforms that service your geographical area. Next, isolate those that provide you the largest / most active user-base and the best usability features. 2. From this final list, choose 2 – 3 commission-based third party platforms. 3. Now that you have a rough online ordering system portfolio in place, you’re better positioned to negotiate for more favorable terms. Since you won’t be using every 3rd party platform under the sun (some restaurants use 10+! ), you can potentially leverage your “exclusivity” to your advantage. Remember, all of these 3rd parties have a common goal – to get users to order YOUR food through THEIR platform. a. A more competitive commission structure. b. A more favorable listing placement on your chosen search platforms. 1. Above all, choose an in-house portal that allows you to convert a meaningful portion of new customers from your portfolio of 3rd party partners. A Bain & Company study with Chick-fil-A shows that a five percent increase in customer retention can increase a company’s profitability by 75%. So, pick an in-house platform that offers leading-edge tools to increase customer engagement and retention. 2. Correspondingly, combine a seamless in-house ordering system with efforts to improve operational efficiency. Keeping good employees happy and productive should be a priority, especially in the fast-paced world of restaurant hiring. Some areas that will make life easier in-house are order management consolidation via our partners Chowly & ItsaCheckmate (nationwide) and 3rd party delivery fulfillment Relay (NYC area). 3. If you’re curious about whether 9 Fold’s value proposition is right for you, please reach out for a free consultation. Our team would be honored to help you put together the most attractive online ordering portfolio for your brand! Finally, if you have any experience with delivery apps or SaaS online delivery systems, we’d love to hear it. Comment or share your thoughts below.